Sydney Opera House and Harbour Bridge. Photo by Keith Hajovsky. There are so many decisions to make when you begin planning a trip to the land down under. This was a bucket list destination for me, and my first time to Australia — and though I had three weeks in the country, I didn't want to spread myself too thin and hop from place to place too much. I chose to concentrate my time on the East Coast of the continent, and explore other regions on a future trip. Going for the ascent to the top of the Sydney Harbour Bridge. 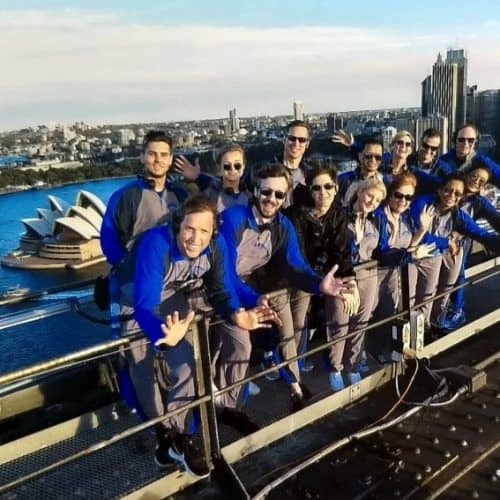 Photo courtesy of BridgeClimb. Flying into Sydney, the plan was to spend about a week in three distinct areas: Sydney, Brisbane, and north Queensland coast hopping our way from south to north. The cities of Sydney and Brisbane both offered completely different experiences and adventures — here are some of my highlights from each. This is where the vast majority of international travelers to Australia begin and/or end. One of the most beautiful cities in the world, Sydney's iconic skyline with the unmistakeable Opera House and Harbour Bridge is recognizable to almost anyone. 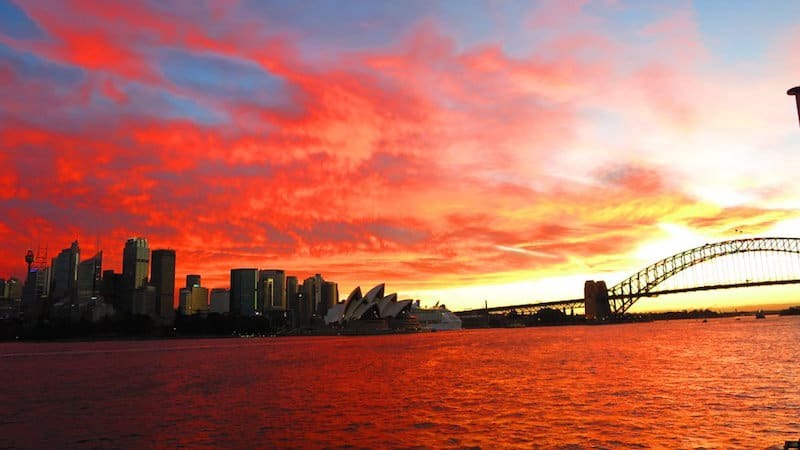 The city fans out from the sparkling harbor to iconic Bondi Beach in the east, golden Palm Beach in the north, the adventure capital in the west and Australia’s oldest national park in the south. The Opera House shells under construction, 1965. Image: Max Dupain, State Library of NSW. We began our first full day in Sydney with a tour of this unique architectural masterpiece, with a look unlike any other in the world. As American architect Frank Gehry said, this building "changed the image of an entire country." It was designed by Danish architect Jørn Utzon, who won an international competition held in 1956-57 to select the plans for the new building. In the modernist style of the era, Utzon's sculptural design that resembles either wings or the sails of a ship, depending on the eye of the beholder, seemed ahead of its time. 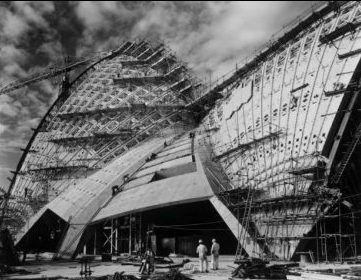 Sadly, Utzon never saw the completed Opera House with his own eyes; as construction pressures mounted, Utzon left Australia midway through the building process, never to return to see the project completed. 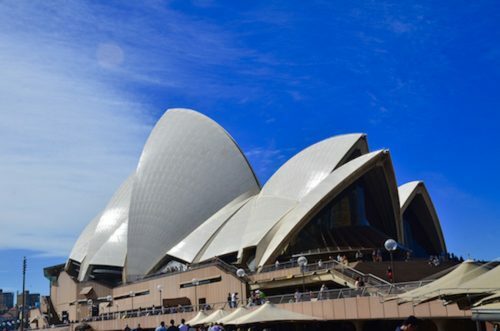 The Sydney Opera House is Australia's number one tourist attraction. Photo by Keith Hajovsky. 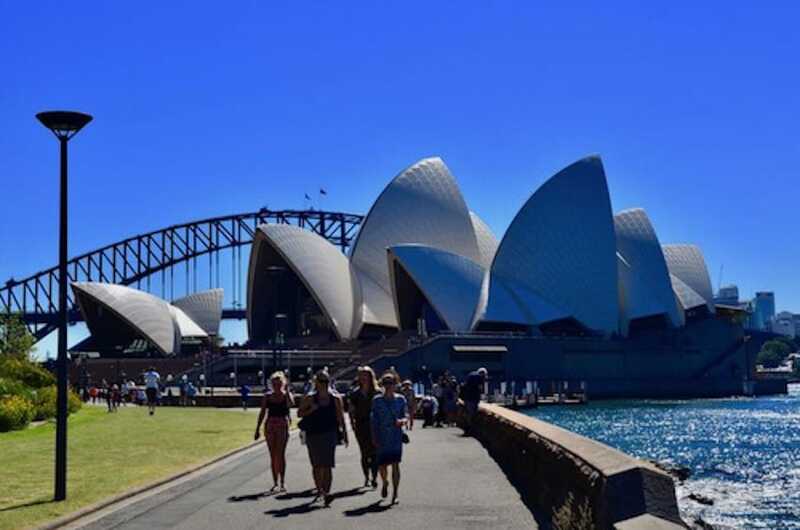 The Opera House is Australia's number one tourist attraction and with good reason. I highly recommend a guided tour for the incredibly interesting story and a behind-the-scenes look at the interior (which is actually highly unmemorable in comparison to the exterior, but the details of the entire building are fascinating). Tours run daily between 9 am and 5 pm, and often sell out so you should book online. They last about an hour and cost $40 per adult (child and family tickets available). Afterward, you might want to grab a bite or a drink at the Opera Bar, with some of the best views of the harbor that can be found — including the little ant-like figures of people climbing across the top of the bridge across the bay, which was to be our next adventure. Not for the faint of heart, this is an adrenaline-rush experience that is honestly not nearly so scary as it seems, once you're up there. I had first seen the bridge climbed on the television show The Amazing Race years ago, and ever since then, I have wanted to do it. Climbing the Sydney Harbour Bridge. Photo courtesy of BridgeClimb. BridgeClimb Sydney are the folks who do this, and it's a pretty impressive operation. A large facility and highly-trained, experienced staff lead you every step of the way, from suiting up to practicing on the indoor rails, ladders, and catwalks. On a busy day, the guides take 2,200 climbing to the peak of the bridge's arch and back again. Everyone is connected by headsets, and I have to admit my heart was beating fast as we were harnessed onto the steel cables and set out across the first catwalk and ladders that go up to the base of the bridge. This was a nice, easy practice to calm the nerves and realize that, hey, it’s a lot like just walking. Geared up, clipped on with steel cables, dozens of feet above the ground and about to climb up nearly 450 feet above Sydney Harbor to stand at the very top of the arch. Gulp. Along the way, the guides give interesting tidbits about the construction of the bridge and the city itself, along with a few corny jokes. Most of the ascent and descent are along easy steps, so it's really not as difficult or scary as it sounds like it might be. I have to admit, however, that standing at the very top and looking down between the steel beams to the traffic below, and the water even further below that, was an awe-inspiring moment. There are no cameras or phones allowed on the bridge climb, but the guides take photos all along the way which they provide you afterward. It's also good to note that they do a breathalyzer on every participant before the climb, so no tippling beforehand! There are several great beaches around Sydney — Bondi and Bronte are two other very popular ones, but a trip by ferry to Manly is a quintessential Sydney experience. It's sort of the Australian version of the Staten Island Ferry in New York. The ferries leave from Circular Quay in the harbor, run frequently, and only cost around $7 AUS (you can use the Opal card which is also good on the buses and trains). The 30-minute trip offers some of the best sightseeing and photography views of the city from the water, and sometimes you can see dolphins along the way. Tip: If you plan so that you're coming back into Sydney around sunset, you'll have a magnificent scene like the one I got below. Sunset over Sydney Harbor from the Manly Ferry. Photo by Shelley Seale. 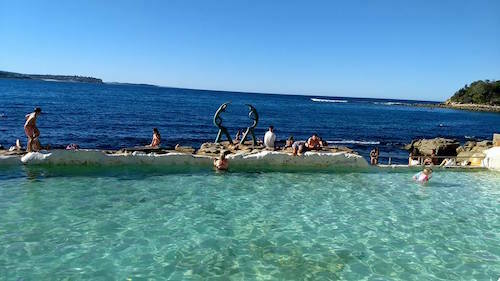 Public pool along the walk between Manly and Shelly Beaches. Photo by Shelley Seale. Arriving in Manly, the beach is a really easy walk along a wide boardwalk called The Corso, lined with shops and eateries, only a few blocks from the wharf. You can swim, hang out on the beach, surf (there are a surf school and board rentals), or stroll along The Cabbage Tree Bay Eco-Sculpture Walk to other beaches such as Shelly Beach at the other end of the path. There's even a really nice oceanside pool along the way, and it's fun seeing how many of the sculptures you can spot along the way — some of them are really small! This was definitely a highlight of our stay in Sydney. The World Heritage area is densely forested, with peaks and valleys that definitely cast a blue hue against an often misty sky. We rented a car for the day, but you could also easily do this trip by train, as station stops are at several of the major sites, or by tour coach and public buses that go out there. The Three Sisters in the Blue Mountains of Australia. Photo by Keith Hajovsky. 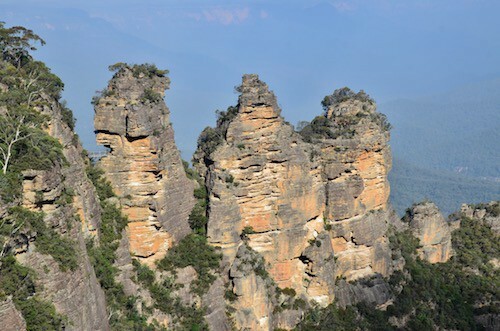 The Three Sisters is the Blue Mountains’ most spectacular landmark, located at the town of Katoomba. This rock formation with three peaks jutting majestically more than 900 meters into the sky is named from an Aboriginal legend, which has it that three sisters, 'Meehni', 'Wimlah' and Gunnedoo,' were turned to stone. The lighting of the Three Sisters changes throughout the day, including floodlights until 11 pm, making different and spectacular views at various times. You can also take a little pathway down to the Giant Stairway and Honeymoon Bridge, which leads out to a tiny, towering rock outcropping that's visible from the observation platform above Three Sisters. Some of my other favorite spots in the Blue Mountains were Wentworth Falls and the charming town of Leura, filled with cute little shops, bookstores, cafes and cultural venues. If you wanted to make an overnight trip of the Blue Mountains, I think Leura would make a most charming place to spend the night. The iconic Brisbane sign with the city skyline in the background. Photo by Keith Hajovsky. Just an hour and a half flight from Sydney, Brisbane isn't as large and therefore more manageable; but still a vibrant, cosmopolitan city in its own right. 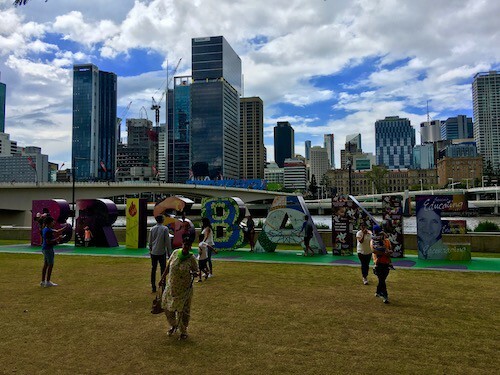 A great way to get started making Brisbane's acquaintance is by taking a free Brisbane Greeters tour, led by locals who love their city and showing it off to visitors. They also offer various themed tours — for instance, we took the public art-themed tour and really loved it, and getting to know our guide, Charlie. Kids absolutely loved the raptor flights at Lone Pine Koala Sanctuary. Photo by Keith Hajovsky. This was the highlight of my Brisbane visit, and one of the best experiences of my time in Australia. This sanctuary is one of the best in the world, and is the world's first and largest one for koalas, with around 130 of the adorable creatures. Like good wildlife sanctuary organizations, there is a major conservation and education component at Lone Pine. There are a large number of unique-to-Oz creatures that reside here, from the koalas to kangaroos, wallabies, platypuses, kookaburras, Tasmanian devils and more. 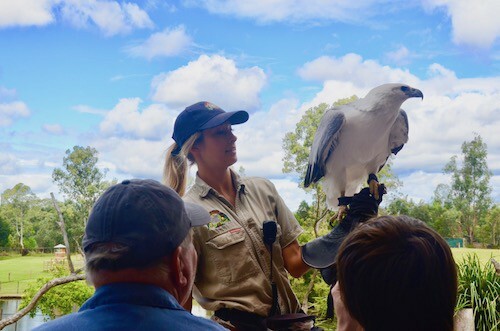 A variety of interactive talks and shows are held each day, such as the Raptor Free Flight, Sheep Dog show, Koala Keeper talk and more. 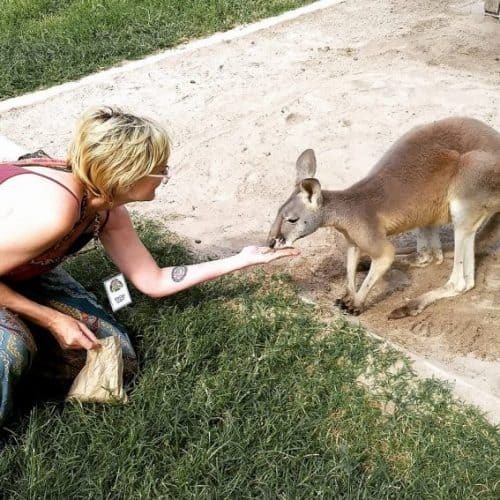 Feeding kangaroos at Lone Pine Koala Sanctuary - my life is now complete! Photo by Keith Hajovsky. But the absolute best part of the day there came in two opportunities: one, to actually hold a koala and even get your photo taken with it; and two, to hand-feed the kangaroos, which are plentiful here. Honestly, I kept saying over and over it was the best day ever, like some of my childhood dreams were coming true. I've always been fascinated by wildlife, and at one point thought I might become a zoologist or marine biologist. Moreton Island is an easy day trip by ferry from Brisbane. Photo by Keith Hajovsky. Located about an hour by ferry from Brisbane on the Queensland coast of Australia, 98% of Moreton Island is protected national park. This is important because there are a number of species that live here, and whose habitats are being severely threatened by trash and pollution. Sea turtles, dolphins and the quizzical dugong all live in these coastal waters. The Tangalooma Island Resort occupies the only 2% of the island that is developed — and as an ecotourism initiative that is doing a lot of things right. The entire resort has a very casual, easygoing, chill vibe; and the educational aspect is front and center in all the things they do. It's approachable and friendly, much like the Aussies themselves. 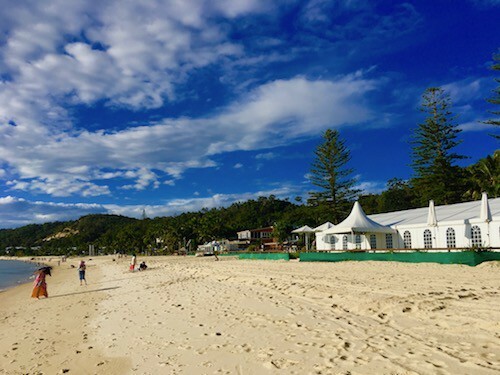 There are a lot of activities you can do on Moreton Island, from kayaking, paddleboarding, and parasailing to sand dune sledding and helicopter scenic rides. A top experience here is the chance to feed the wild bottlenose dolphins that live in these waters. The team here knows each dolphin by sight and name; not because they are tagged — they are wild dolphins, after all, and not controlled or interfered with in any way. But each dolphin’s dorsal fin is completely unique, like a person’s fingerprint, and they know all the dolphins who live in these waters. Feeding wild dolphins at Moreton Island. Photo courtesy of Tangalooma Island Resort. 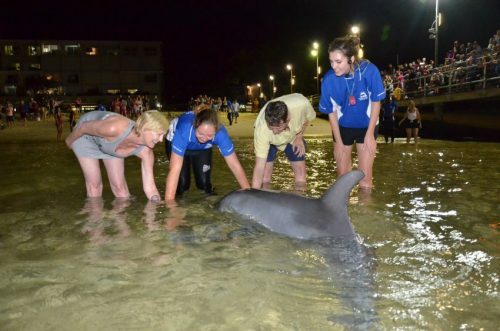 In our nighttime dolphin feeding, we were approached by Tinkerbell, the bossy alpha matriarch of the pod. We were given a fish each to hold in our left hand, approached very slowly into the thigh-deep water, and then held our fish under the water. Tinkerbell, who along with about eight other dolphins had been swimming up in the shallow water waiting for the nightly snack, approached and so gently took the fish from between my fingers. Her touch was delicate, almost — what an amazing experience!